A white refrigerator has a clean appearance that attracts many homeowners. In a light-colored kitchen, it can help create a bright atmosphere. In a dark kitchen, it can create a stunning contrasting focal point. Whether your kitchen is light or dark, a white refrigerator covered in fingerprints made from skin oils and dirt, food or beverages though can look grimy. Over time, fingerprints can also harden and stain making them difficult to remove. To clean fingerprints off your white refrigerator doors, you need to remove any old prints and then maintain the surfaces. 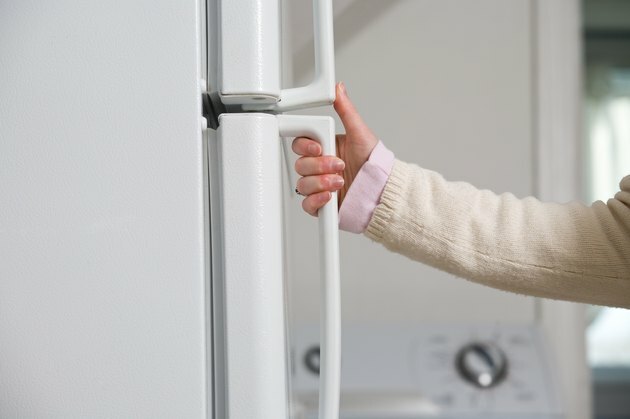 You may need to detach your refrigerator's door handles to remove fingerprints. Open your refrigerator door, and transfer food items from the door shelving to the interior racks. Wipe the interior and exterior of the refrigerator doors and the door handles with a soft, microfiber cloth moistened with hot water and a few drops of your favorite dish detergent. Rub away old fingerprint stains with a moistened scratch-resistant scrubbing pad. If you're dealing with textured or grooved door or handle surfaces or refrigerator door gaskets, sprinkle a damp, soft-bristled toothbrush with baking soda and brush away the particles. Dip the scrubbing pad in 1/3 cup white vinegar, and sprinkle it with baking powder to deal with a tough stain. Scrub the stain gently using a circular motion until you've removed it completely. Moisten another cloth with warm water, and then wipe the doors and handles again to remove residues. When you're finished, buff the surfaces with a dry cloth and return the food items on the racks to the door shelving. Can You Clean the Inside of the Refrigerator With Bleach?